Daily Look Elite Box is a monthly clothing and styling subscription service similar to Stitch Fix, Wantable Style Edit, and Trunk Club. When you sign up, you take an in-depth survey about your sizes, your style, and pricing preferences. Your stylist handpicks items based on your preferences and they generally range from $50-$300. Before your box ships, Daily Look Elite sends you a preview, where you can remove items and let them know why. You also have the option of looking through their website and favoriting items that they will consider adding to your boxes. The fee for this service is $40, and that includes free shipping and free returns. And if you keep any of the items they send you, you get to deduct the $40 fee from the total. You can skip a month anytime. This box was sent to us at no cost for review. (Check out the review process post to learn more about how we review boxes). Inside my box was an envelope with information, invoice, and a return bag. Inside the envelope was this letter from my stylist, Lisa. She notes a couple of the pieces sent and why they were chosen and how to style them. I also received a packing slip that lists each item and the price it would cost to keep each. I received a total of 8 items this month. I also received a prepaid return label, bag, and instructions. You have five days to decide what you’d like to keep or return. Once I decided, I headed over to my online account to let Daily Look Elite know which items I’d be keeping vs. returning. It also gave me the opportunity to provide feedback on what I liked and disliked. At last, a jumpsuit I dare to keep! This solid jumpsuit is actually long enough for me (with flats, at least) and I think the neckline is very flattering. It’s still a little out of my comfort zone but with a jacket and the right accessories, I think this will be a great piece to have in my closet. This blazer is another great piece. I’m concerned about the wear-ability though – even with my best effort at steaming the fabric was holding onto wrinkles for dear life. I’ll have to try a secondary steaming session before wearing it. Hopefully once those from shipping are out the fabric won’t be too easily wrinkled during wear. This is a classic blazer and I love the design! This is such an easy way to class up a simple outfit like jeans and a tee for a day out and about. Another classic and versatile piece: a tan trench coat! While this is a great staple and never out of style, it’s just not my own style. I like it, but I don’t think I would personally reach for it. The quality is definitely there, though. This coat is lined and has all the details like the buckles around the wrists and the upper part of the back. I’ll be honest – I’ve never actually tried on anything that’s cashmere! Oh, I do love it – so soft and crazy comfortable. I relished trying this piece on, but I am just so not in the phase of life where I should be buying a $284 cashmere sweater. There’s no way I could get enough wear out of it to make it worth it while taking care of a 3-year-old and 1-year-old. One day, maybe. But for now, this baby had to go back. Tie front tops are usually too short on my torso, but this one has good proportion. I think the tie detail is flattering and I love this color! I feel like I should own more of it. 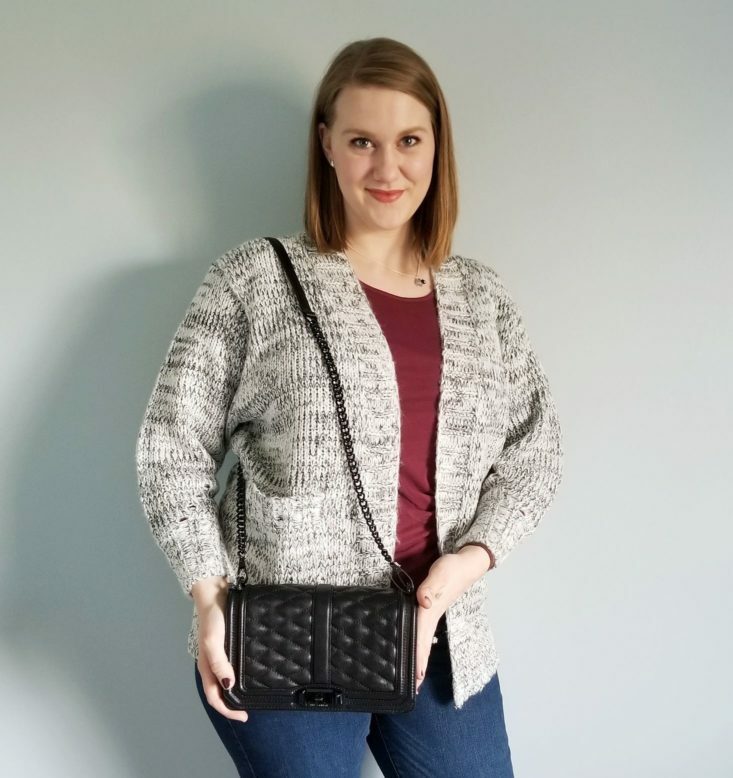 This chunky-knit sweater fits well and is extra comfy, which I’m all about in Winter! I love the looser, cozy fit to the sleeves and the button detail on the shoulders is cute, too. There’s another knot-detailed top! This one is also a great color, and I love that it’s an easy top to throw on and go. The knot detail makes it look put together on its own. The fabric is soft and comfortable, though the arms were a little snug on me. I was first introduced to the Dreamers brand through a different subscription box and have learned they make really great cardigans. This is another piece that features a chunkier knit from a very soft material, and I could grab it to add to just about any outfit. I’m all about dressing in layers because I tend to run cold until I have to chase down my toddlers! How gorgeous is this Rebecca Minkoff bag? It’s all black leather and the front has a really cool quilted pattern. The handle is removable and is made of a black chain with a leather section where it rests on your shoulder. This bag is a little heavy all on its own, but I can tell this bag is very sturdy and high quality! Verdict: This was great Daily Look Elite box for me. My last box felt a more Summer appropriate so I’m happy to see that the stylists listened to my feedback of wanting to see some more long sleeves, sweaters, and layers! Absolutely necessary this time of year in Michigan. The pieces they sent this month all felt so high quality! I had fun trying on my December box. Can I still get this box if I sign up today? 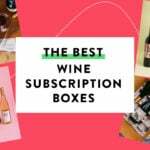 You can sign up for your first month’s box now, but your selections will look different than mine. Value Breakdown: For $40 a month, I received eight styles that came to $1,127.95 in retail value. I can keep or return any of the pieces with free shipping both ways! If I do keep anything, the $40 styling fee will be deducted from my order. Check out all our Daily Look Elite Box reviews and the Women’s Clothing Subscription Box Directory! What do you think of Daily Look Elite Box? 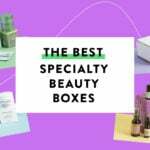 Haley Faye first discovered Beauty Army and Birchbox in 2012 and instantly fell hard and fast for the world of subscription boxes. Over the years of writing for MSA she has found many subscriptions to fuel her addiction, but her favorites include fashion, geeky, beauty, and mom/baby boxes to share with her son. How do subscribers rate DAILYLOOK? Do you subscribe to DAILYLOOK? Add your rating now! Dear Haley, I love the cardigan the most! The blue blouse also look amazing on you, while the other pieces look short. I think they should send you longer pieces, what you need like the jumpsuit, the top is stunning on you but the bottom doesn’t flatter you. Sorry but it needs to be like 5 cm longer. Nice review, it’s great to see you smiling all the time, I love your hair also. Great pieces! Blue sleeveless and the cardigan are my favorite on you. "Anyone know what time boxes launched for annual subscribers today? Just trying to get a ballpark idea of what ti..."
"I already resubbed! Can’t wait to see more spoilers I def can’t wait for june boxyluxe"
"That's probably it, although I can't even find that spoiler page anywhere. Thanks for your response."